Speaking of Felton, I have a club calf guy a little older than me that I do a little ET work for. He likes to talk while we work and his favorite stories seem to be about working for Frank Felton back in the '70s while a student at Northwest Missouri State at Maryville, MO. He claims Felton routinely turned multiple bulls out in one breeding pasture. Keep in mind this was long before DNA testing, probably before bloodtyping. He said one time they turned out 3 bulls and he asked Frank how he could register the calves? Frank replied that he could tell what calf belonged to each sire by looking at them. Kind of makes you realize a pedigree can be wrong a lot of different ways. In my opinion Mr Felton was one of the most unethical breeders there was. No doubt he knew good cattle but that doesn't make him honest or ethical. And the above story brings more creditibility to the story of why AHA records don't show him having any carriers in his herd. My understanding is all carriers were eliminated but never listed as such. When these stories are from those who helped him and follow similar practices I tend to put some trust in them. This is one reason I've been slow to consider using his breeding. Maybe the new DNA test if it ever happens will bring some clarity to what has been hid in the past. Not sure many are ready for it and that the AHA will fight it ever being released. You can rest assured there will be deal cut like the one with Felton and others in the past to protect the guilty. elkwc, I like your post, but I ask myself: " A deal to protect the innocent or the guilty?". In the 1960's and early 70's there was a local Hereford breeder here, who had good cattle and was quite the promoter, now deceased. When he had his bull sale, he would have the pedigrees for the sale bulls in a stack. After a buyer would pay his for bull and enquire for the papers, Mr. Breeder would say "Just take the pedigree off of the top of the pile, it's as good as the next!" Thankfully, few, if any of his cattle went on to registered herds. To re-quote my great grandfather Lars Myran: "You can't breed cattle on paper". And he started saying that in the late 1940's. Your great grandfather nailed it way before we knew all about this mess. Even more true today. I'll stick with my Plato Ruperts and Victor dominos. 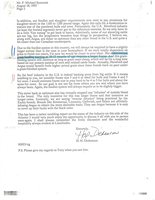 This almost seems insignificant compared to what is happening with Trust, but I have been told that Mr. Hall from Australia has written a letter that accuses BT CL DOMINO 15G of being a cross bred. If anyone has a copy of that letter, I would like to see it and what proof he might have presented. I may have misunderstood but I think the bull George mentions was connected with the New Zealand paper by Jolly et al that I posted the link to previously. Sounds like the two most confusing days of the year are "Fathers Day and Mothers Day"
I was thinking one thing and wrote another. When I saw your post I went back and read mine and not sure how I wrote that. You were right about what I meant. 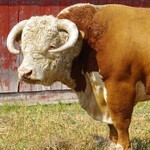 One of my favorite stories of the early Hereford cattle is about the Cotmore bull UK#376, US#150, who was born in England in 1836. At maturity, this bull weighed about 3,900 lbs. or roughly 1770 KG. As I remember the story, Cotmore was shown against a prominent Shorthorn breeder’s bull at a time when the Shorthorn was the dominant breed in England. The Shorthorn show string was sent by rail, boat, and finally arrived at the town hosting the show in dray wagons. Cotmore lived on a farm about 70 miles from the show, and so in order to get there, Cotmore was walked the 70 miles to the show which he won, and then he walked the 70 miles home again. It is ironic to me that it was once common in the Hereford breed to have very large, efficient, long living cattle, only to lose much of that frame over time for several reasons, and then have the circumstances of the 1970’s through the 1980’s demand that frame size again. However, this time, non-Hereford genetics were used to accomplish the increased frame size. Isn’t the breed then a “Composite” that reverts to non-uniformity and unpredictability regardless of the EPD/EBV’s? Hybrids are usually terminal crosses as they always revert to the parents in an unpredictable fashion. Perhaps this is why there are possibly 4 other breed’s genetics other than Hereford in the modern Hereford genome, because once you start crossbreeding, you can’t stop or your cattle’s quality deteriorates dramatically in time. Aren’t we then, committing “Breed Suicide” by not using actual purity tests and forcing ourselves as breeders to maintain at least a minimum of actual Hereford breed purity in the purebred Hereford herd? Very well stated and you made some valid points and expressed some concerns that need to be considered. From what I've seen in many herds of the last 3-4 years many herds are already there. The day of looking at a group of calves and them all looking alike and being able to say just gate cut me so many and they will be as good as any left is gone in many herds. The herd we purchased the heifers from this winter is that way. Not a nickles difference in any of them. Like he said the only way to know you got the best one is to buy all of them and after they raise a few calves you will know. But that herd is the exception and not the norm. I know of a few other herds that way but not many. And only one polled herd in this area have I saw any consistency. Today’s post is something that has been in my possession for some time, but was unavailable for public view, until today. In my opinion, the following has direct bearing on the current political situation of the Hereford community both here in the US, and internationally. It certainly lead to a letter of inquiry to the HCS in England which is also copied below. 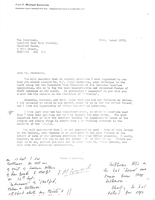 "The attached letter came from the extensive collection of historic Hereford records assembled over many years by the internationally renowned English and Australian Hereford breeder and Judge, Mr. Henry Cooke Dent, known as "Bennie" for his passion for his great-great uncle's establishment of the Hereford cattle breed, Benjamin Thomkins, credited with creating the Hereford breed, the image of whose bull Wellington appears as Plate 1 in Volume 1 of the (UK) Hereford Herdbook. Bennie Dent judged Hereford cattle many times from The Royal Show in Auckland, New Zealand in 1968, at the Three Counties Show in England in 1977 and for the Burke Trophy (all breeds) at the Royal Show in the UK 1979. Being a descendant of Benjamin Tomkins, the most prominent of the original Hereford breeders, responsible for setting the coat pattern and white face predominant in the real Hereford, Bennie Dent was a passionate Hereford breeder, not only walking his favourite heifer calf from Stoke Edith to Brook House Kings Pyon, fifteen miles away, (he was then aged 9 years old) to be sired by a bull and once sired, walked her back again to Stoke Edith. Such was my father's commitment to the Hereford cattle breed." 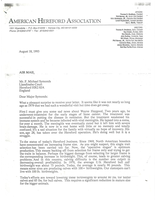 Guests may also read these letters in their entirety on my facebook at Steven Pollestad. I hadn't realised that the present HCS secretary was in post in 1993 - he retires shortly. This must have been about the time of the beginnings of the Rare Breed Survival Trust. detecting any fraud or willful violation of the rules in the registry of cattle therein. I read your attachments, and I will be happy to forward to the board, but you need to be more clear in what you are intending with the email. Do you know of someone that is breaking the rules. I think that Hop did a good job of describing the growth trend through the 70s and 80s, but that just shows that Hereford breeders got caught up in a fad. I understand the blue line of using only grass to feed and grow cattle, but again, the systems have not changed much over the years and I applaud those that are using a grazing style to grow beef, and I will support the grain fed systems as well. It is not the associations job to dictate the programs breeders and their customers use. Please let me know the clear message I need to send to the board and I will get this out to them. As per the requirement of Article XIII of the 2015 version of the By Laws of the AHA, I respectfully present the attached for your and the AHA Board's perusal. I would be interested in your response to this information. That the AHA has known of and ignored the use of non-Hereford genetics in the Registered Hereford Genome, and this is by Hop Dickenson's own hand. As you know Research has already shown that the tested samples of the AHA registered Hereford Genome is testing out as 50% pure Hereford when compared with the genetics of researched and documented samples of the Original Population Hereford Genome. When will the door of further dilution of the Hereford genome be finally closed? I respectfully submit that this should be done before there is no longer a Hereford left to use. I further respectfully submit that the only way to close this door is for the AHA to implement the use of the new Hereford breed purity test that is reported to be available in Wales in the autumn of this year. This test will cover actual Hereford breed percentage and parentage verification. The use of non-Hereford genetics in the registered Hereford herd has become a worldwide problem in the Hereford community, and the AHA along with it's sister Hereford breed organizations around the world have an opportunity to be leaders on this issue by being united in the promotion and implementation of the use of the Actual Hereford Purity test and to also publish the Actual Hereford breed percentages on the pedigrees of each registered Hereford animal. This should not be tied in any way to an EPD/EBV value, but be a stand alone figure that every Hereford animal should have regardless whether the owner uses TPR or not. I have a question. What does everyone hope to get done or take away from all this? Sounds to me if Trust is 89% then he is better than most of the U.S. population being at 50%. Looks to me like it's the same old song. No one's happy then when it's time no one steps up to do the job that no one wanted anyway. Three sides to every story. His side, their side, and the the truth. While I an not trying to start anything or point fingers. But we have to move forward, not backwards or sideways. Jay, my interpretation is that the general U.S. Hereford population is about 50% related to the OPH herd. Then Trust is about 89% of that, making him about 45% Hereford. Still. I think we are taking the science to far in cattle breeding. It seems as if there are three groups of people when it comes to this matter. Group 1 prefers to keep their head buried deep in the sand and continue breeding "Hereford" cattle, crossbred or not, while maintaining the status quo. Group 2 is actively engaged in protecting their own interests, which means attacking the credibility of the science and/or the parties involved in questioning the purity of the breed. Group 3 is legitimately concerned about preserving the integrity of the Hereford breed, even if it causes themselves some short term financial distress. I would really like to see if the survey that showed that U.S. Herefords are only 50% related to the original population studied if that dissimilarity was consistent with official history of the breed. Given the history of the breed, I would expect a considerable divergence between the original UK population and the North American Hereford. If memory serves me correctly, the Hereford Herd Book was closed to new blood in 1879. Most of the importations to the U.S. occurred during the 1880's. After which, the original population and the North American Hereford went their separate ways. This combined with the officially closed herdbook would lead me to believe that the two populations of Herefords would have be more dissimilar than many other breeds are to each other. It closed in 1886. Pure herefords, regardless of where in the world they are should trace back on both sides to herdbook volume 13 of 1886 without outside influence. 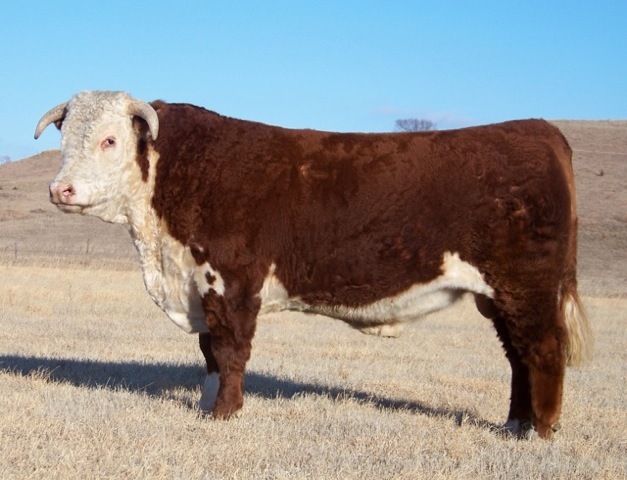 Herefords have become a composite breed, at least in North America. Might as well turn them black and collect the CAB premiums. I often ask myself why I actually care about purity when so many other people obviously don't. Maybe all we need to produce beef are composite animals of different colours. I just think it's very sad that our predecessors spent years and such a lot of time and energy producing a breed of cattle that were so good at what they were required to do that they flourished all over the world, yet in the last forty years it has been almost lost in the name of progress and fashion.